As we saw in 2013, corn price movements can have a big impact on steer prices. Feed prices are obviously important for feedlot operators, but they have implications for stocker and cow-calf operators as well. Recent crop condition reports and yield estimates, combined with a 3% reduction in planted acres versus last year, indicate that corn production will almost certainly be below last year’s. However, that does not doom us to higher feed costs in the coming months. There is still a lot of old-crop corn out there, indicating that the 17/18 ending-stocks-to-use ratio will be similar to 16/17. Thus, we are likely to see corn prices remain low through harvest this fall, assuming the weather holds in corn country. Feed costs are especially important from an industry perspective this year because of drought conditions in the northern High Plains. Cattle in drought-stressed regions will likely move south early, meaning that they will be put on grass (instead of the wheat they would graze if they had come later) or will go directly to feedlots. 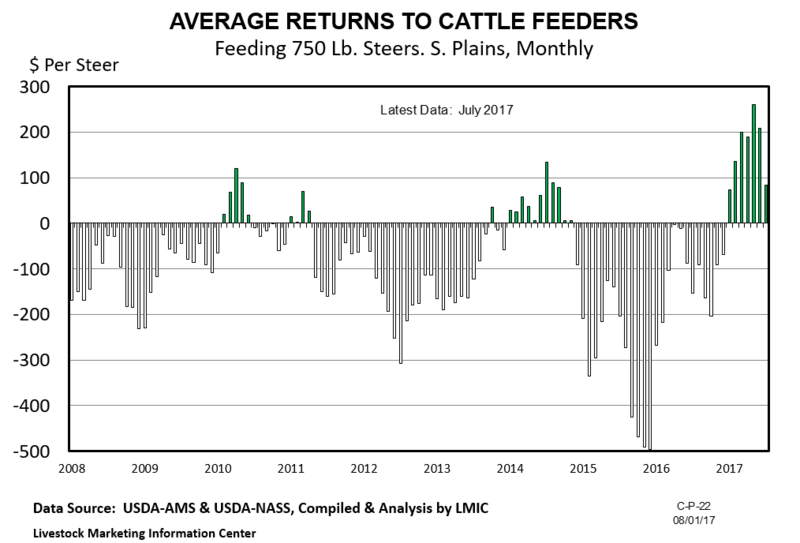 Feedlot returns have been positive during 2017 thanks to both low feed costs and strong beef demand fundamentals. This is, of course, good for cow-calf producers and stocker operators, as positive feedlot profits have put upward pressure on calf and feeder prices as the herd has continued to expand. For more on this topic, check out this month’s “In the Cattle Markets” publication from the Livestock Marketing Information Center. Posted in Beef Cattle. This entry was tagged feed. Bookmark the permalink.